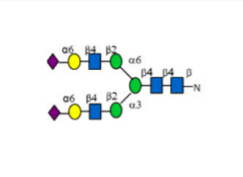 The 100 synthetic glycans featured in the Glycan Array 100 are the most frequently identified structures showing important binding function in the literature. Provides high-throughput detection of binding partners in purified proteins, serum, plasma, cell culture supernatants, cell/tissue lysates or other body fluids. Upon receipt, all components of the Glycan Array 100 kit should be stored at -20°C. 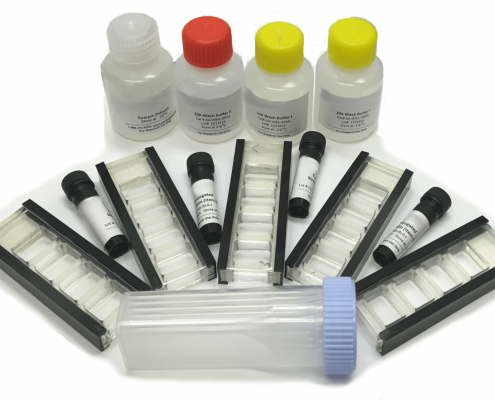 After initial use, remaining reagents should be stored at 4°C to avoid repeated freeze-thaw cycles and may be stored for up to 3 months (Labeling Reagent, Item B, should be prepared fresh each time before use). Unused glass slides should be kept at -20°C and repeated freeze-thaw cycles should be avoided (slides may be stored for up to 6 months). The entire kit should be used within 6 months of purchase.